1. JIMS ( Jagan Institute of Management Studies) Sector 5 ROHINI is looking for an experienced, reliable and task oriented professional. Qualification: Graduate with high proficiency in English. Knowledge of working in Excel and preparation of PPT is must. Experience: Previous experience in a top level, high pressure, deadline oriented professional environment will be preferred. Freshers can also apply. Send CV with photograph latest by 22nd sept including “ Executive Assistant” in the subject line. 2. 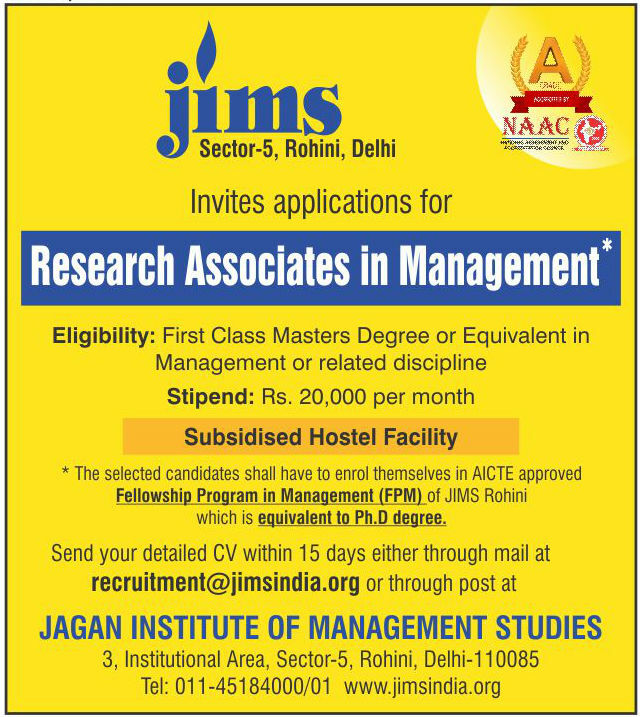 JIMS Rohini, invites applications for Research Associates in Management. The selected candidate will have to enrol themselves in AICTE approved Fellowship Program in Management (FPM) of JIMS Rohini which is equivalent to Ph.D degree.